We all hate washing up, but we all love a Highland Cow! 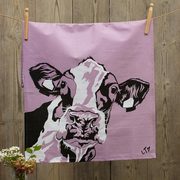 So beat those washing up blues with a pair of cheeky Highland tea towels. With Rhett our windswept beast and Alfie the cute calf, these two animals will make you smile no matter how many dishes you have to dry!